Snap shooting is essentially just another term for the old cowboy skill of ‘shooting from the hip’. It is the fastest way to fire off a few quick accurate shots as snap shooting does not require you to spend time drawing your marker to the normal aiming position. The best drill to help improve your reflex time and accuracy with snap shooting is to establish a safe practice area, set up a number of small targets (such as tin cans) about 100 feet from your starting position. Move about 25 feet towards the targets and quickly fire off between 5 and 10 paintballs at each target before returning to your starting position. It doesn’t matter if you don’t hit the targets first time round as with each attempt you’ll greatly improve. A key skill to getting an edge over the competition is to position yourself in the best place where you can attack and also defend against any impeding attack from the opposition. What’s also needed for this tactic to work is clear communication, seeing as you will need to work together with your teammate. This manoeuvre is commonly referred to as Leapfrogging, where you take it in turns to advance towards a pre-determined goal – whether it is the opponent’s base or a location on the field of play where you can hold off the enemy so your team will be victorious. Practise this move with a partner to perfect your technique, the more you practise advancing and taking cover the better you will become at outplaying the opposition. 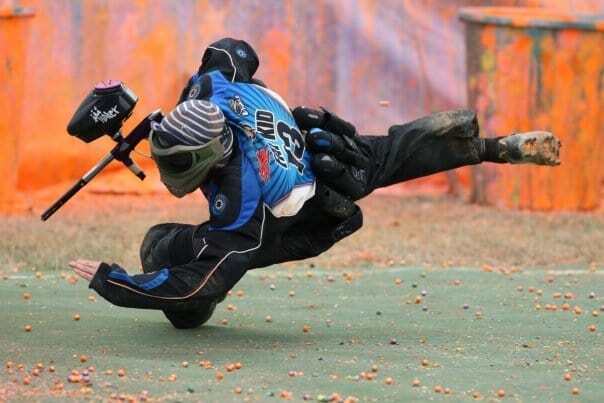 Most professional paintball players would tell you that shooting while moving is one of the most important skills in paintball. The best way to improve your skills in shooting while moving is to set up a stationary target in your practise area, and practise shooting at it while moving in different directions and at a variety of speeds. Once you get the hang of shooting while moving, it’s also a good idea to learn how to shoot while retreating. As the old saying goes, “practise makes perfect”. Training exercises like these are used by professionals and semi-professionals alike and when practised regularly they can greatly improve some of the most important aspects of your paintball game. There are many places on the internet you can find other useful paintball tips, tactics and exercises but make sure you have a look through the Delta Force Paintball blog – you never know what kinds of useful information you might find!